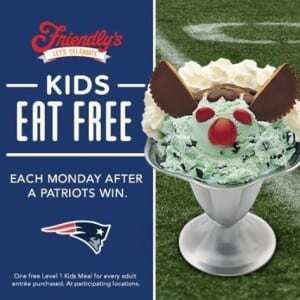 During the NFL Season, when the Patriots win, kids can eat free the next day at Friendly’s! For every adult meal purchased, your family can receive one Level 1 Kids Meal free at participating locations. Just one more reason to cheer for the Patriots this year! Go Pats! !